Elephants are the hallmark of Savute Elephant Camp, and their large presence dominates Savute Elephant Camp from the moment you enter the gates. The main lodge area of Savute Elephant Camp sits on a well watered lawn on a high and dry riverbank. Steps take you down to a resort-style swimming pool with a balcony overlooking a man-made waterhole. The terrace is just high enough to look down upon the elephants, but if they chose to, the elephants could reach up and sniff at your ankles! 200 Elephants at the Waterhole! They are more interested in splashing in the jet filling the waterhole, and I was transfixed, while my travelling partners went off to settle into their Savute Elephant Camp tented thatched chalets. I was still standing on the safari lodge balcony when my group returned in swimming costumes to take a dip in the cool blue pool. As they lay on sun loungers catching some warm winter African rays, the parched bush scenery stayed constant, but the cast of characters constantly changed. As a large lone male elephant arrived, he asserted his dominance and demanded pride of place at the water jet - sometimes physically butting others out of the way. On occasions whole elephant families arrived, led by a colossal matriarch, accompanied by babies barely in control of their wobbly trunks. During the driest months from August to October, up to 200 elephants have been witnessed hanging around this permanent man-made waterhole.I eventually dragged myself away and went to freshen up, unpack and check out my room. Identical to all the other Orient Express Safari Camps and Lodges in Botswana (Khwai River Lodge and Eagle Island Camp), the tented rooms have every luxury you might need and some you don't. Hairdryer, electronic safe, telephone (only to the main lodge), heater/air conditioner, huge walk-in mosquito net, minibar fridge and a writing desk with a bird, plant and animal checklist amongst personalised letter paper in a leather-bound manual. A hot water bottle inside your bed is extremely welcome on cold winter evenings, and to go with the turndown, is a sweetie on your pillow and a short bedtime story with 'Tales from the African Bush'. 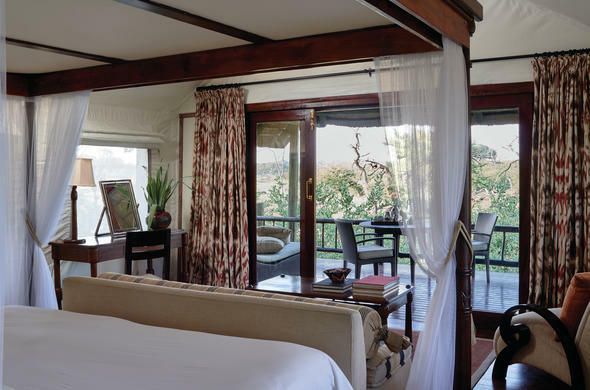 The style at Savute Elephant Camp is comfortable and so unobtrusive that you remain focussed on the safari experience, rather than any innovations in interior design. I strolled from my room back to Savute Elephant Camp central lounge and dining room for afternoon tea and snacks. Served once again in typical Orient Express Safari Style, with more than enough nibbles and cakes to fill the small gap since the last meal. 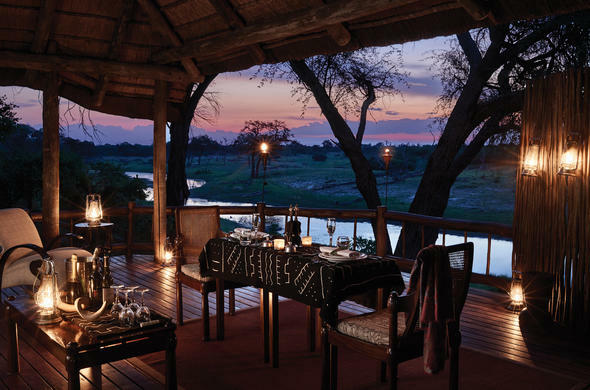 A menu rota between all three Orient Express Safari lodges ensures that visitors staying at each of the lodges, never repeat the same meal.. Savute Elephant Camp also offers dining under the stars in their log boma (traditional meeting place). This is always a pleasurable, atmospheric experience, usually with barbecued food on offer. With Andre Roodt and Anita Batistic at the helm as Camp Managers, the food was tasty, the staff were happy and the atmosphere jovial. Andre and Anita are well suited to managing Savute Elephant Camp, mingling easily with the guests. Andre has good a good few safari stories up his sleeve too, like when a lion (or was it a leopard), visited the dining room and everyone hid behind the bar. Or when lions came and lay down by the safari camp log fire (outdoors), sending guests scattering. Lions, leopard and hyena regularly drink at the Savute Elephant Camp fountain, but usually in the dead of night when everyone is asleep. No such dramas happened during my stay, but the stories were very exciting and served as a reminder that we were deep in the bush and this was big animal country.Our evening game drive proved this beyond a doubt, as we came across a pride of 20 lions - which is not uncommon in this part of Botswana's Savute region. Amongst them were 14 lion cubs of various sizes and 6 doting mothers, who emitted maternal murmers to the hiding but curious youngsters. They were eventually given permission to gambol down to the waterhole, where all 20 lions lined up to drink. The lions of Savute (also spelt Savuti), specialise in hunting elephants, as this is their main food source in this sparsely vegetated area. Good sightings of elephants and lions are almost guaranteed from Savute Elephant Camp on any given day. 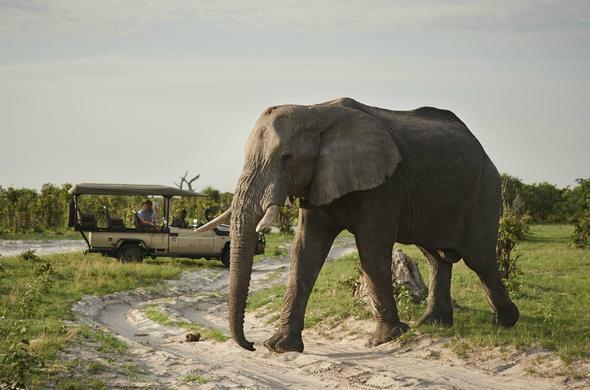 One of the many differences about a Botswana Safari, as opposed to a South African safari, are the guides. 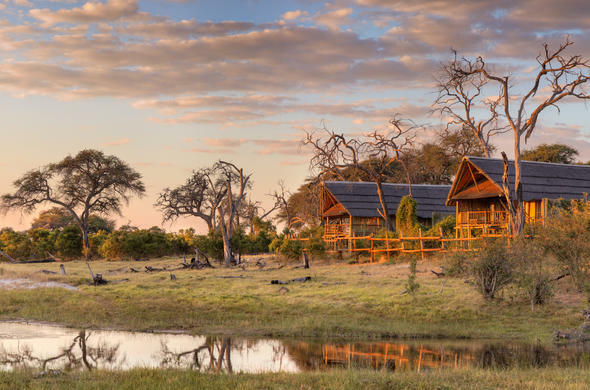 In Botswana and particularly at Orient Express Safari Camps, most of the guides are local and have lived in the Okavango Delta area all their lives. They will happily answer questions, rather than spout facts and figures at you (which can be the case with some young and eager SA guides). They know African animals intimately and can predict their behaviour, and track them easily. In true African style, the Botswana safari guides tend to be relaxed and unhurried, which is something most city-dwellers can learn from.© Carrie Hampton 2004. This article is written by Travel Writer, Carrie Hampton, who is under no obligation to state anything other than her personal opinion. The words or photographs of this article may not be reproduced in any form without permission. Accommodation consists of 12 luxurious twin bedded tents with en-suite facilities that have a "his and hers vanity unit" and a dressing room area. 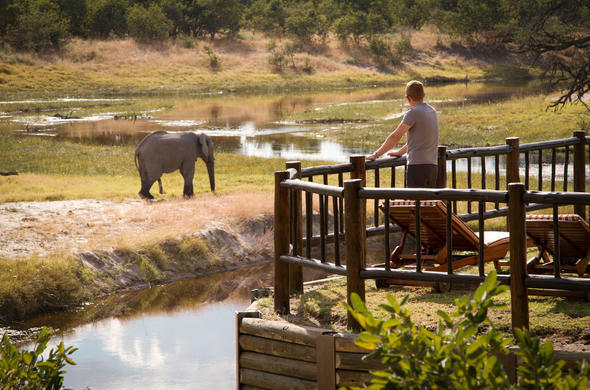 Savute Elephant Camp is situated on the Savute Channel in Chobe National Park, which is in the rugged, semi-arid wilderness region of far northern Botswana.